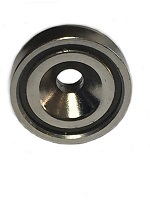 Cup magnets (also known as pot magnets) offer a strength and versatility found in few other magnet options. The steel cup these magnets feature houses the magnetic neodymium material and simultaneously strengthens the magnetic field while protecting the neodymium from the impact of surface strikes. 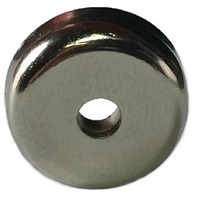 Cup magnets allow for a variety of mounting applications with mount styles including male stud, female stud, steel hook, steel eye hook, and counterbored holes. The model shown here features a countersunk hole that allows for flush screw surface mounting. We offer a variety of sizes and pull strength weights to handle just about any need, and if you need a size or pull strength beyond our listed offering, contact one of our highly trained sales staff with your custom specifications, and let’s get your project started.